We grew out of a sub committee of the Marden Society, which in 1998 was considering the Village Design Statement. Before long it became obvious that the heritage of the village was such, that an enormous amount of material was available and needed to be organised. As the group grew we became independent of the Marden Society, but still retain close links. Now the Marden History Group has a steering group of eight who meet eight times a year to plan the work, with various sub-groups and aided by a large and enthusiastic group of volunteers working on a variety of projects. 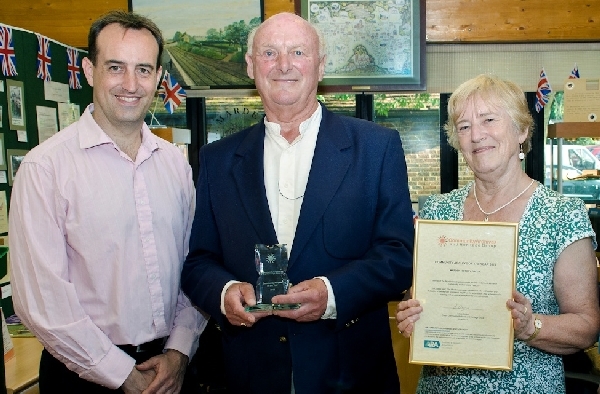 Dr Nick Barrratt, David McFarland and Eunice Doswell with the award certificateMarden History Group has won a national award for its community archive. Some 63 submissions from across the country were entered into six categories of the competition, run by the National Community Archives and Heritage Group (CAHG) supported by the Archives and Records Association, UK and Ireland. The history group won the inaugural overall Community Archive of the Year title. In addition to the award, the work of the volunteers at Marden’s Heritage Centre was also recognised with the prize for the Most Interesting Community Archive for solving the location of the Marden Bronze Age hoard. The announcements were made at the CAHG‘s 6th annual Conference in London. Marden History Group chairman David McFarland made a presentation in support of the submission and was joined by archaeologist John Smythe, who displayed items from the Bronze Age hoard to the conference members. The following evening, John Chambers, Laura Cotton and Marie Owens of CAHG, and family historian Dr Nick Barrratt visited the Marden Heritage Centre, where Dr Barratt presented the awards. The guests, and members and history group volunteers were joined by Cllr Paulina Stockell and parish councillor Dorothy Reed for a celebration. KCC, Marden Parish Council and Maidstone Borough Council were instrumental in funding the original 2008 set up of the Heritage Centre, which is based in the library.